“Hackers” & “gamers” wanted to raise the bar on safety! Düsseldorf, 18 April 2018 - At the bi-annual trade fair, Wire and Tube 2018, held on 16-20 April in Düsseldorf, ArcelorMittal showcases its wide products range and a number of new investments, innovations and digitalisation initiatives. It would be hard to imagine a world without steel. The metal – in its myriad forms - plays a crucial role in life from domestic applications to larger industrial ones. But as requirements change to meet new stringent demands, so must the steel industry adapt and stay of these new trends. ArcelorMittal Europe is presenting many of its latest innovations and its wide range of products at Wire and Tube 2018, all of which are designed to provide solutions for its customers and help them adapt to changing industry norms. ArcelorMittal provides steel solutions for a wide variety of industry sectors. At the Wire and Tube trade fair, the world`s largest steel producer is showing its products and services for the automotive, transport,construction and infrastructure, mechanical engineering and the energy sectors. Tubular Products Europe is a leading manufacturer and marketer of tubes for the automotive industry with a wide range of welded and cold drawn mechanical steel tubes and tubular shapes, fabricated parts and precision components. ArcelorMittal Fresnoy (France) is located close to the automotive center of Valencienne and has produced steel tubes for more than 70 years. “Today’s range includes precision steel tubes for automotive as well as industrial applications. Fresnoy is a center of excellence for Magnelis®, which ensure corrosion protection up to 10 times higher than conventional hot-dip galvanized tubes, as well as galvanized and aluminized tubes.”, comments Jeyachandran Rajasekaran, CEO of ArcelorMittal Tubular Products. In addition to the automotive sector, ArcelorMittal Tubular Products offers a comprehensive and diversified range of tubular products that include cold and hot finished hollow sections, cold and hot finished pressure pipes as well as plain, galvanized or colour-coated pipes in a vast array of steel grades. Freeform®: A steel solution to produce ultra-high strength engine bolts with improved hydrogen resistance. Advanced steel forging grade SOLAM® B11001 with a yield strength of over 1100 MPa, providing weight reductions of 20%, obtaining a 30% performance increase while eliminating costly heat treatment steps. Advanced steel grade SOLAM® M2050 S – Cor, developed for suspension springs to reduce weight by up to 20% by increasing mechanical properties and improving fatigue resistance after corrosion. 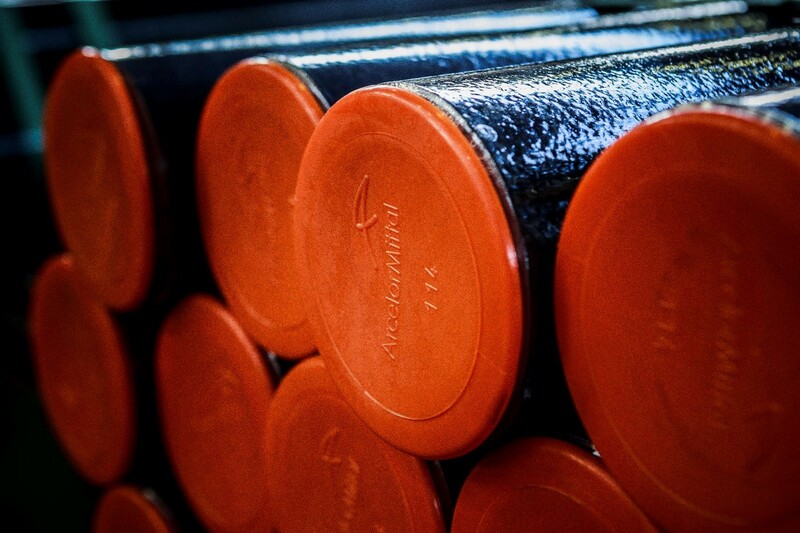 As a leading supplier for the mechanical engineering, our production equipments of ArcelorMittal Gandrange, Duisburg and Warsaw, includes state-of-the-art sizing block, integrated bars conditioning line and surface and ultrasonic testing. Besides Revigny-sur-Ornain offers a diversified portfolio: from low carbon, high carbon and alloyed steels, to leaded and unleaded free-cutting steel grades, with sulphur, for heat treatment, case-hardening grades. The mill is producing 80kt per year of cold drawn, peeled and grinded bars and offers a special brand grade Usimax®. Usimax® is a free cutting steel solution allowing high mechanical characteristics and high level of productivity in machining operations. A central theme among ArcelorMittal Europe – Long Products latest developments is digitalization. “We have recently re-engineered Net Steel, our customer dedicated web platform, offering various services to meet customer`s demands and fulfil the requirements of industry 4.0 . The user-interface is fully customisable and provides real time updates and visibility to the customers.”, comments Augustine Kochuparampil, CEO of ArcelorMittal Europe – Long Products. Another example is ArcelorMittal’s EDI (Electronic Data Interchange) services which automates data flows from and to customers. Messages for Order Entry, Order Response, Dispatch Advice, Certificate and Invoice are automatically generated and can be exchanged over virtually any connection and file format. Certificate management on the customers ERP systems and help to significantly reduce workload as well as process throughput time. The latest investments of ArcelorMittal Europe – Long Products in the Sosnowiec and Veriña plants (highly homogeneous internal quality, finer diameter tolerances and higher surface defect detection) allow the production of high-quality wire rods dedicated to high demanding including automotive, construction and engineering. ArcelorMittal employs more than 78,000 people and produces approximately half of its total steel volume in Europe. With a presence in 17 European countries and around 400 different sites, ArcelorMittal Europe had revenues of €36,2billion and a crude steel production of 41 million tonnes in 2017. We supply flat and long steel products for all major steel markets, including the automotive, construction, packaging and household appliances industry.